Ingrid Bagby's practice is concentrated in bankruptcy, restructuring and related litigation. She represents creditors and debtors in chapter 9 and chapter 11 proceedings, and out-of-court restructurings, and has extensive experience in complex cross-border restructurings, including acting for foreign representatives in proceedings under chapter 15 of the Bankruptcy Code. Ingrid regularly advises strategic investors and market participants on bankruptcy issues related to financings and acquisitions involving distressed entities. She has been recognized as a key individual in corporate restructuring by Legal 500. Ingrid is a member of the American Bankruptcy Institute, INSOL International and the Bankruptcy Litigation Committee of the Federal Bar Council. 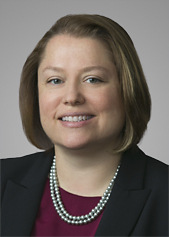 She participated in UNCITRAL's working group on proposed additions to the Model Insolvency Law, and was a member of the advisory committee on executory contracts and leases for the American Bankruptcy Institute's Commission to Study the Reform of Chapter 11. Ingrid has been recognized in the second edition of Euromoney's Guide to the World's Leading Women in Business Law, and she was also named an Outstanding Young Restructuring Lawyer for 2008 by Turnarounds & Workouts. She is a recipient of the Burton Award for Legal Achievement, which recognizes exceptional legal writing. Prior to joining Cadwalader, she served as a judicial law clerk for The Honorable Conrad B. Duberstein, Chief U.S. Bankruptcy Judge for the Eastern District of New York. Ingrid received her undergraduate degree, with honors, from Georgia State University and her J.D. from Brooklyn Law School where she was an editor of the Journal of Law and Policy. She is admitted to practice in the State of New York and before the United States Court of Appeals for the Second Circuit, and the United States District Courts for the Southern and Eastern Districts of New York. Represented official creditors' committees, ad hoc committees, lender groups and significant creditors in chapter 11 cases across the country, including, most recently, an ad hoc committee of bondholders in the chapter 11 case of CEDC International Finance Corporation, Inc., MBIA, Inc. as a member of the creditors' committee in the chapter 11 cases of Residential Capital, LLC and its affiliates, and the official creditors' committees in the chapter 11 cases of Truvo, Mirant Americas Generation LLC and Heartland Automotive. Ingrid also has advised corporates on restructuring and bankruptcy issues, including The Amsterdam at Harborside in its pre-negotiated chapter 11 case, Lehman Re Ltd. of Bermuda in its chapter 15 bankruptcy case and related Bermuda liquidation, Northwest Airlines in its chapter 11 case and Bear Sterns with respect to a potential bankruptcy filing. Extensive experience in cross-border restructurings and related U.S. bankruptcy proceedings, including roles in Cablevisión S.A., Jazztel plc, DAP Holdings, New World Network International, the KWELM group of companies, MMG LLC, Texon International Limited, Hopewell International Insurance, North Atlantic Insurance Co. and BTA Bank (Kazakhstan). Regularly acts for clients in bankruptcy-related litigation including representing The Royal Bank of Scotland in litigation relating to the Tribune and Marco Polo Sea Trade chapter 11 cases, ABN Amro Bank N.V in litigation relating to the chapter 11 cases of Tronox Incorporated and M. Fabrikant & Sons, Inc, as well as the United Kingdom administrators of RSL Communications Plc in their breach of fiduciary duty litigation against the company's former directors.